Laser selected titanium trebles paired with a flexible composite core in the basses come together to produce a truly remarkable set. The new (2012) Dynacore basses are winded using a revolutionary technique. Players who prefer rich tones along with projection will favor these basses. The trebles produce brilliance and projection. As a full set, the basses and trebles work together and compliment each other achieving tonal balance. In my last order of strings I ordered one set of these to give them I try ... they are fantastic. I've been playing them (flamenco) every day for almost 3 weeks now and they are still sounding great, clear and with very little wear. The coating on the basses is great, it doesn't turn brown at all. I'm impressed, really ... and the price is very good for such quality. I'm ordering a bunch more right now. I am a diehard J46 Pro arte user. I am a 30+ year flamenco and classical guitarist. I tried these strings recently looking for longer life and a slightly brighter tone. Dynacore's are great, i loved them right away. The basses sound great, and the Titanium trebles are very sweet and the diameter is not so different from the pro arte. I got used to them quickly, and i love the sound. I was excited but skeptical about this new set, and yet I am enthusiastically surprised that, in fact, it performed splendidly on my guitar. I strung my German Vazquez Rubio blanca, which sports the lowest action ever attempted on a flamenco guitar [courtesy of the infallible master, Peter Tsiorba], with a set of Dynacore "Hard" Tension. 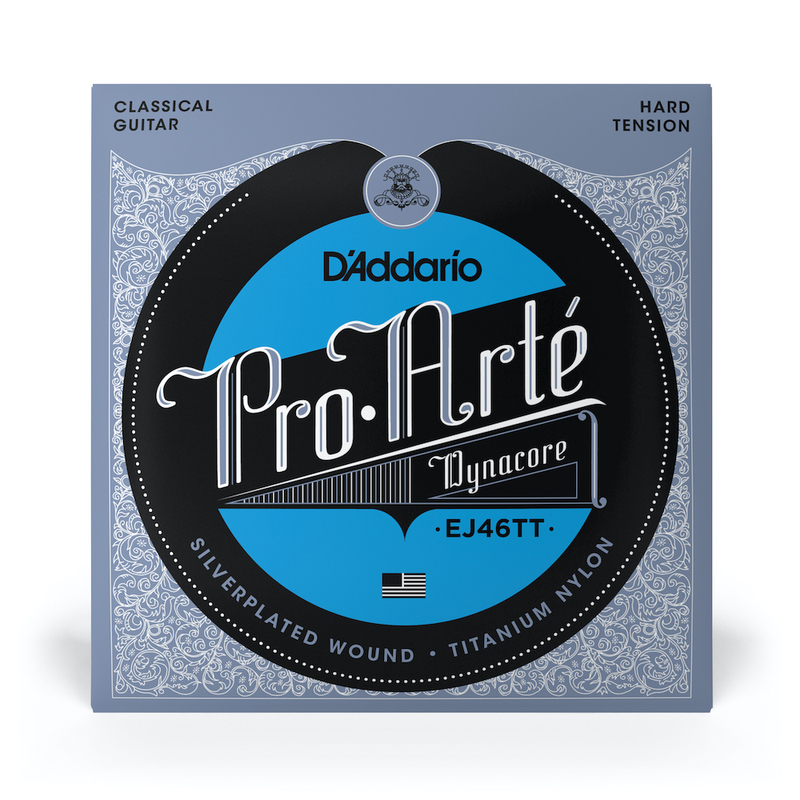 Indeed more brilliant and responsive than any of the D'Addario I tried thus far, whether Pro Arte or their Composite variation, with an accentuated metallic timbre that blends harmoniously with the titanium trebles. They also are quite flexible, even the hard tension variety. I had tried titanium trebles before, and while I had enjoyed their thinner and perhaps more brilliant sound [than their conventional nylon counterparts] I always regretted a want of lyricism in their quickly expiring resonance and more frigid response. However, within this set, these trebles performed beautifully, bringing out [or better, accentuating] the voice I like to hear from my blanca: thinner but loud, metallic yet lyrical, deep but uncompromised by excessive sustain. There is a saying, that if you run out of ideas or excitement to compose or interpret, you should learn a new instrument. I find that while this may hold true as written, a refreshed sound to your own instrument may yield the same result. After stringing it with the Dynacore set, I just could not stop playing the guitar. I woke up really early today [the usual 4am, Sunday notwithstanding] and played every piece of Flamenco/Fakemenco I had learned or composed but had relegated to the attic of my mind, among good but obsolete memories. Thank you, D'Addario, well done indeed. Each guitar may find its own voice with a different tension, brand and type of strings; each player, in turn, has his own distinct expectations and discrete ways to husband the sound he wants to hear. Hence, this set may work for you, could simply leave you unimpressed or, worse, may even disappoint you greatly and arouse an irresistible fit of rage [causing you to curse me and my review.... well, then please re-read this disclaimer, once again]. However, yet, I am happy to report that I and my dear German Vazquez Rubio are both exceedingly pleased with the Dynacore set. These strings are most definitely NOT the EJ46C basses with titanium trebles; these basses seems to be like D'addario's version of a Savarez corum-style bass string. The strings are perfectly round, and intonate perfectly up and down the neck. The basses aren't as stiff as the EJ46C basses, nor even as stiff as the EJ46 set. The titanium trebles significantly enhance the projection of the treble strings, and create a more even response along the entire guitar, somewhat a similar to the sonic balance of a savarez matched set. The titanium trebles feature a bit a more elasticity than their corresponding nylon counterpoints; for this reason, as well as the lack of d'addario's trademark stiffness in the bass strings, I use the hard tension set, where I previously used normal tension nylon and carbon string sets. The result is louder than an EJ45 set; a bit quieter than an EJ46 set, but not nearly as strenuous for the left hand; and similar volume to a savarez normal tension alliance set, but with a fuller, thicker sound. You get the same diameters, and the tension applied to your guitar is the same as any corresponding EXP or Composite series set, but with a brighter, and more balanced character. The longevity of the strings is phenomenal; once the strings are on for two weeks or so, the sound still contains a bright character, and the squeak is nearly non-existent. These strings represent a true innovation in contemporary guitar sound, due to the proprietary bass strings made to balance with their existing titanium trebles.